ISO 9001 gives assurance to work partners that you work in a structured and controlled manner. ISO 45001 ensures your Health & Safety is up to international standards. Food Management IS0 22000 is showing a 14% growth at present. We have experience in the food & drink sector. ISO 9001 opens up new markets. 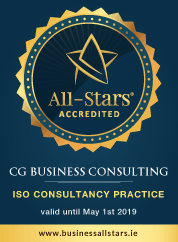 CG Business Consulting helps accountants, solicitors, communication companies and other professional service companies join the over 70,000 companies around the globe that are ISO 9001 certified. We have worked with many engineering firms. When ISO 9001 certified, over 75% of companies report improved customer satisfaction/loyalty. ISO 14001 Environmental is also relevant to this sector. Increasing productivity will lead to increased revenue. ISO 9001 can unlock potential by streamlining processes and adapting best practice. ISO 14001 lessens impact on the environment. Any industry sector will benefit from ISO 9001, ISO 45001 or ISO 14001 certification. The variety of our clients mean that we can implement an ISO 9001 quality management system for any company.